Pizza Hut is launching a spend-based loyalty program that allows unlimited accrual of points, the company announced today. The Plano, Texas-based division of Yum! Brands Inc. said “Hut Rewards,” which is available today, also offers a flexible point redemption system, allowing customers to redeem points for any medium or large pizza. Pizza Hit said its loyalty program, unlike those of its competitors, allows points to accrue without daily limits. And as part of the introduction, loyalty members can earn double points Aug. 10 through Oct. 1. “We noticed other loyalty programs had limitations in how they rewarded people, and as a brand with a belief that ‘No One OutPizzas the Hut,’ we recognized the need to create a first-of-its-kind program, specifically an unlimited points program that rewards every dollar,” said Jeff Fox, Pizza Hut U.S. chief brand and concept officer, said in a statement. Pizza competitors have offered loyalty programs for several years. Louisville, Ky.-based Papa John’s International Inc. launched its Papa Points loyalty platform, which morphed into Papa Rewards, in 2010 and Ann Arbor, Mich.-based Domino’s Pizza Inc. debuted its Piece of the Pie rewards program in September 2015. Mark Kalinowski, an analyst with Nomura/Instinet, welcomed Pizza Hut’s new technology efforts. “Loyalty programs have helped business at Papa John’s and Domino’s, and could do so for Pizza Hut as well,” Kalinowski said in an analyst note Monday. Hut Rewards awards two points for every dollar spent, awarding customers for fractions of dollars as well. The points can be redeemed for a medium pizza at 200 points or a large pizza at 250, the company said. “Whether spending $20 or $100 dollars, Hut Rewards is the fastest, easiest way to receive free pizza,” Fox said. 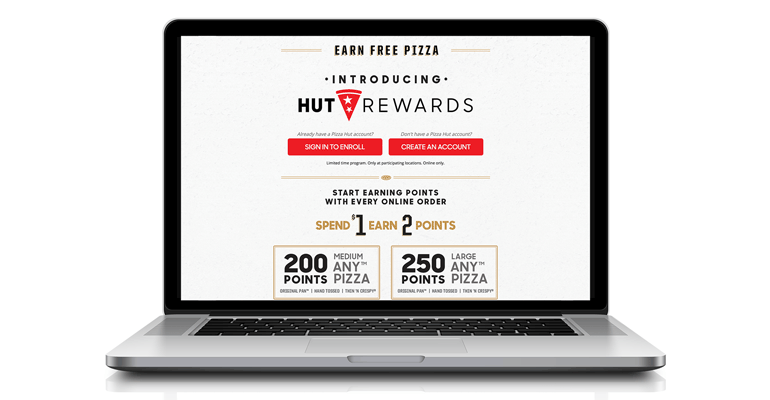 To participate for the rewards program, new Pizza Hut customers can opt in through the Hut Rewards page of the PizzaHut.com website and complete a profile for a digital account. Existing digital customers can sign into their account and then join the Hut Rewards program. Pizza Hut said other Hut Rewards benefits include special offers and birthday deals. Driver tips, donations and gift cards do not earn points. Upon redemption, the customers are responsible for applicable taxes, delivery charges and delivery minimums. In July, Pizza Hut announced it was overhauling its delivery system, hiring about 14,000 new drivers and improving the accuracy and reliability of its deliveries with a new algorithm. Pizza Hut has 6,300 units in the United States.